A handsome, rather stout plant, about a foot tall, with bright light-green, smooth, graceful leaves sheathing the stem, which has a papery bract around its base. The flowers are in clusters varying in shape, sometimes growing in a long, loose raceme and sometimes in a closer, pointed cluster. The divisions of the rather small, cream-white flowers have short claws, with a yellow gland and a stamen at the base of each. The stamens are conspicuous, with swinging, yellow, shield-shaped anthers, and are at first longer than the three styles, which gradually lengthen and, together with the stamens, give a delicate, feathery appearance to the whole flower cluster. This grows on dry hillsides and in meadows. The bulb is very poisonous. Poison Sego. Zygadenusnus paniculatus. LILY FAMILY. 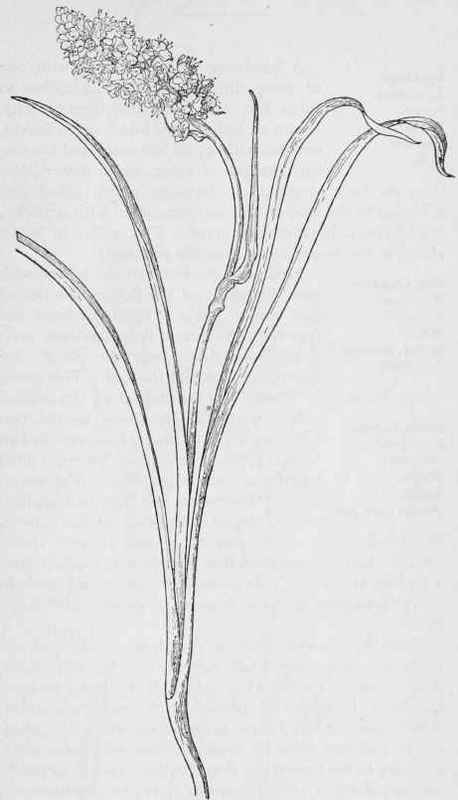 Liliaceae.